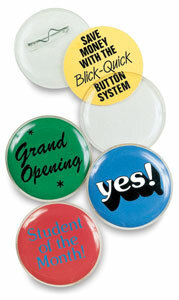 Now it is possible for any individual or organization to make their own buttons! These pop-apart, do-it-yourself buttons are reusable. Simply put the pin in place, insert your message between the two unbreakable plastic pieces, and snap them together. Blick-Quick Buttons are reusable and are ideal for promotions that change frequently. Buttons require no button machine or metal discs to assemble. Each button consists of two clear plastic parts and the back has a pin already attached. Each button measures 2¼" in diameter.